This preview was originally posted on April 25, 2011, but since Clever Mojo Games has now released Sunrise City into the wilds of Kickstarter, I thought it would be a good time to take a look at how far the game has progressed. I’ve played Sunrise City many, many times since this preview and watched as it developed into a fun, approachable and engaging game. To check out how it has grown and progressed, read over the preview and then head over to Kickstarter to check out the campaign! “The idea for the game is definitely inspired by Sim City. I’m sure everyone can relate to starting up a new city on Easy mode, spending that $10k on laying down a nice city, and then scrapping it after you realize you actually have to manage it! While doing the initial development, some other games inspired me: Medici (on iPhone), Metropolys, Caylus, and Carson City. 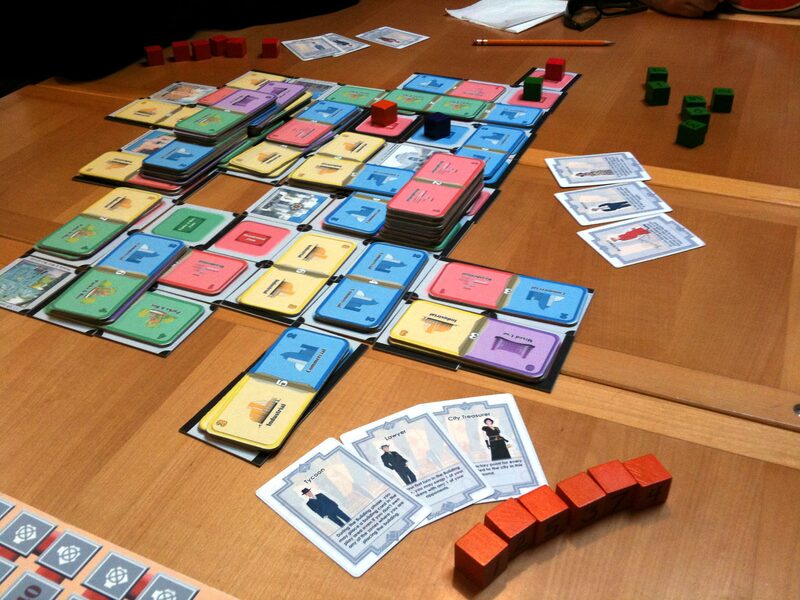 The motivation to create the game came from the Quick Print n’ Play Design Contest on the BoardGameGeek.com forums. I had initially entered a different game into the contest, but a few weeks in Jack Neal, the person running the contest, decided not toenter his city building idea. I sent him a message asking if it would be okay if I entered a city building game and he gave me the go ahead. That same night, I had a bolt of inspiration and wrote out some (terrible) rules. Card and tile art are temps. I'm guessing the giant wooden cubes are hear to stay, though. For a few weeks, I kept tweaking the game and taking advice from forum posters. The game evolved quite quickly, which was exciting, but unfortunately, although I didn’t know it at the time, it was evolving in the wrong direction. I was one edit away from adding in useless mathematical (taxes/rent) mechanics when David MacKenzie from Clever Mojo Games jumped on the forum thread. Luckily for me, he invited me to his weekly play-testing Meetup group and asked if he could take a look at the game in person. 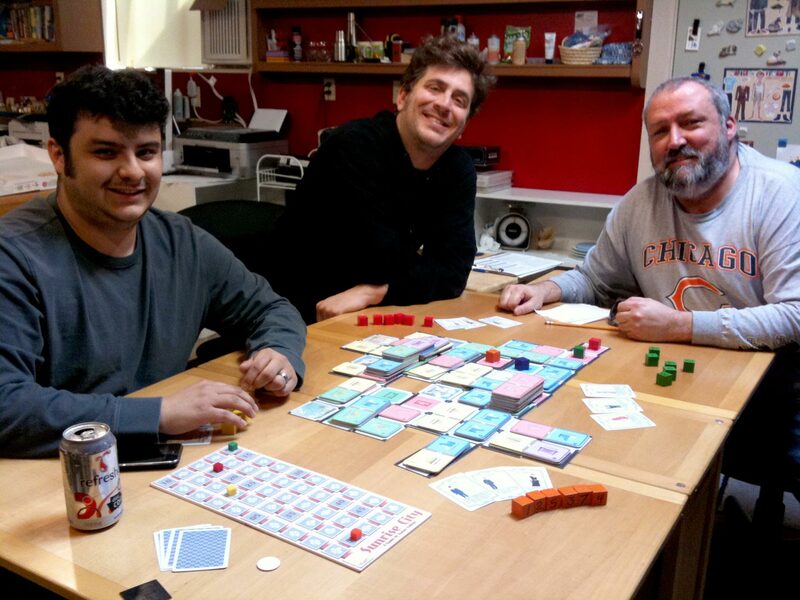 From left to right: Sunrise City designer Isaias Vallejo, regular Clever Mojo Games playtesters Seth and Robert. Isaias was kind enough to send me a copy of the beta rules for Sunrise City and the game has a good mix of smooth play, strategic complexity and great potential replay value. Since it combines three of my favorite gaming things – bidding, tile laying, and city building – this is one game that I’ll be keeping a close eye on as it develops in semi-open playtesting. 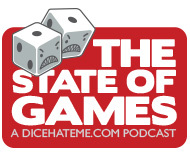 Be sure to watch Dice Hate Me for more updates! A couple of disclaimers: First, for full disclosure, Clever Mojo Games has hired me to handle final graphic design for Sunrise City, but I would think it was a good game regardless. I am paid as a freelancer and so will not collect royalties; I’ll be paid regardless of whether the game is a success or not – which, of course, it will be. Second, I said in the preview that the giant wooden bidding blocks were probably here to stay. I was wrong. I hate when that happens. It has taken me a while to come around to this game. I think I have always associated squarish tiles with one of my all time favorite games Carcassonne . I have had to break my preconceived notions of a game to see that this is a tight game with a lot of interaction. It does have the feeling of a tense land grab as well as a sky grab. 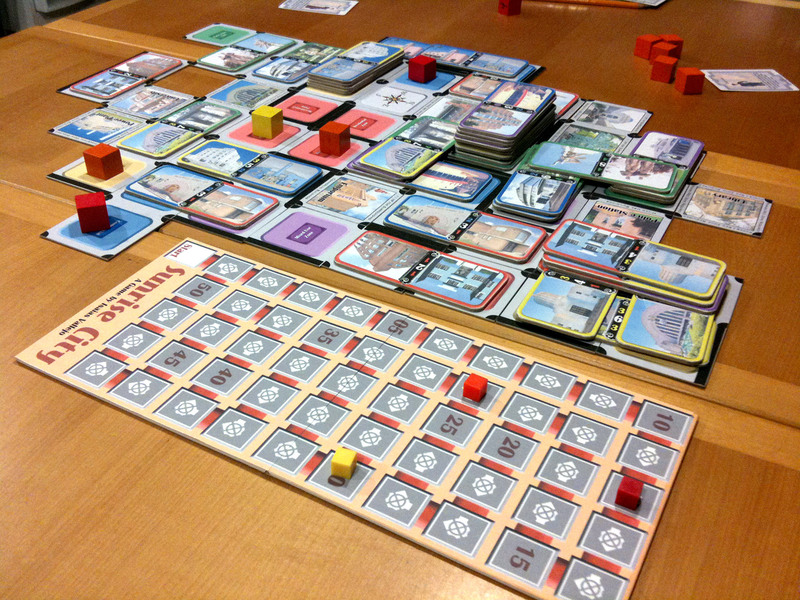 The roles, bidding, and tile placement have a lot of interesting spins to it. I am glad CMG David, Isaias and Drew stuck to their guns on this one. It has taken me a while to come around with this game. I think I have always associated squarish tiles with one of my all time favorite games Carcassonne . I have had to break my preconceived notions of a tile laying game to see that this is a tight game with a lot of interaction. It does have the feeling of a tense land grab as well as a sky grab. The roles, bidding, and tile placement have a lot of interesting spins to it. I am glad CMG David, Isaias and Drew stuck to their guns on this one. Seth – Yeah, I think they have really done a good job of keeping the core of the game solid through many iterations. It’s a pretty relaxing game – a beer and pretzels type of affair, in my book. I like that. It’s comforting and very approachable.